Are We Anti-Aging Too Early? Ours is a society all too accustomed to the perils of anti-aging efforts. After all, we've witnessed the Botox and Filler Revolution — seen in dramatic funhouse-like effect everywhere from The Real Housewives and Cougar Town to Lindsay Lohan's court battles and Nicole Kidman's movies. A lot of this botched facial work has really allowed the youth of America to take a look in the mirror, pause, and say, “Oh, hell no. That just can’t happen to me.” So, we rush to the drugstore (or department store, depending on when the direct deposit hits) in hopes of eradicating what we swear is the beginning of a fine line. Early prevention is the key, right? Sadly, that’s not necessarily the case. Fair enough — and also, pretty obvious. But, it gets more complicated: “People start using ‘lifting and firming’ products at age 20. That’s ridiculous,” continues Dr. Lens. He suggests avoiding these words on any skin-care labels, because they often signal a heavy concentration of peptides, which stimulate collagen production and cellular turnover. That’s great for someone in their 40s and maybe 30s, but will really just put skin cells into overdrive if you’re in your 20s, leading to major irritations. Vargas also cautions against using products containing glycolic acid, an ingredient that gained renown in the past decade or so for having anti-aging and skin-clarifying benefits. “All the peeling it does actually creates skin that looks burnt,” she says. “You may not be breaking out, but that activity will kill the lymphatic system and stop normal cell function, leading to dull, dead skin over time.” In other words, all that work you’re doing now just means you’re tiring your skin out for later. Our experts both agree that 25 is the sweet spot for incorporating (read: not a full regimen) anti-aging products into your beauty routine. But, where does one start? “You should absolutely be wearing an eye cream, even if you see no problems around the area,” says Dr. Lens. 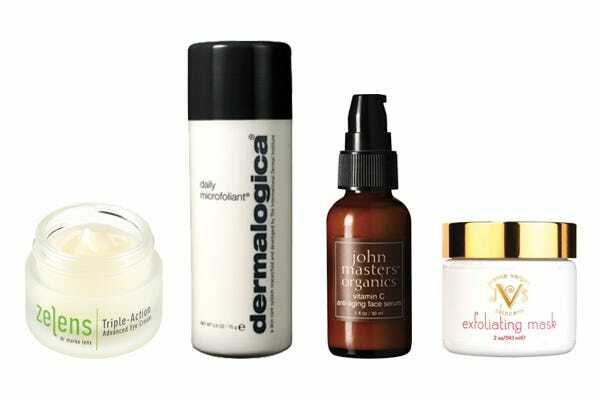 His very own Triple Action Eye Cream is a bestseller at Space NK. For a more wallet-friendly option, try this option from Burt’s Bees. This is for morning and night — you’ll also see a great difference in how your concealer wears during the day. “Start incorporating an exfoliating step into your skin care that promotes cellular turnover,” Vargas says. We know — you’ve been told to exfoliate just two to three times a week your whole life. But, refined scrubs, like Dermalogica Microfoliant or Vargas’ very own Exfoliating Mask, are gentle enough to use before applying a heavier product at nighttime. "This is the time to start with antioxidants," Vargas notes. "They can't hurt and will be a big leap forward into an adult routine." Vitamin C and argan oil are great ingredients to look out for. Try starting with a serum (like John Masters Organics or Kahina Giving Beauty) or opt for a light oil at night (hello, Josie Maran or the divine Kora Organics) a few times a week to see how your skin reacts. If all is clear, Dr. Lens recommends graduating to other user-friendly anti-aging staples, like salicylic acid and PHAs (or polyhdroxy acids). Try Renée Rouleau BHA Clarifying Serum. And, of course, everything else you already know about your skin, from applying sunscreen daily to avoiding excessive drinking and naughty foods, will serve you immensely well. The whole "don't-drink-too-much" mantra was clearly lost on those Housewives. And, look what happened to them!